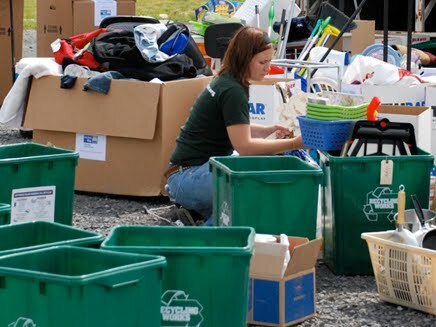 When it comes time for students to move out of their residence halls or apartments for the summer, they may find themselves wondering what to do with the furniture, clothes or appliances they no longer need. In many cases, students will throw these perfectly good items away when they could be put to better use. Recognizing this tendency, the Columbia College Campus Sustainability Committee has set up a move-out initiative to donate students’ gently used items to Relay for Life. The Sunday following finals week, May 9, several members of the Campus Sustainability Committee will drop off the items at the Hertig Apartments. Donated items will benefit the Relay for Life charity yard sale on Saturday, May 15. The move-out initiative is just one of the programs sponsored by the Sustainability Committee, which consists of environmentally conscious students, faculty and staff. The committee meets quarterly to “devise ways of becoming more green” as it says on Columbia College’s Web site. So far, they have installed new bike racks around campus and recycling bins in the residence halls, which include slots for glass, plastic, aluminum and paper as well as organic wastes. The committee is currently focusing on 11 areas of interest where they can incorporate more sustainable infrastructure and programs. Information on the Sustainability Committee and more about Columbia College’s green initiatives can be found at http://www.ccis.edu/green/. A volunteer sorts through college students' unwanted belongings. Photo courtesy of www.gettysburg.edu.